On the night of November 20, a man named Edi Rejang uploaded a video on Facebook of himself harassing a beer promoter in Giant Hypermarket, Ampang Point. Consequently, he received backlash by the public for his unnecessary action. 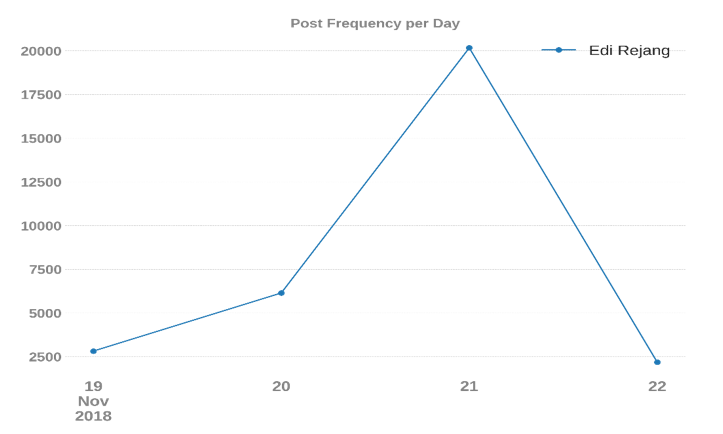 In Twitter, we can see that the amount of post involving the keyword “Edi Rajang” spike on the day he posted the video and peaked on the following day, November 21 with more than 20,000 posts. The incident became a racial topic because Edi Rejang used a racial slur for his video description. 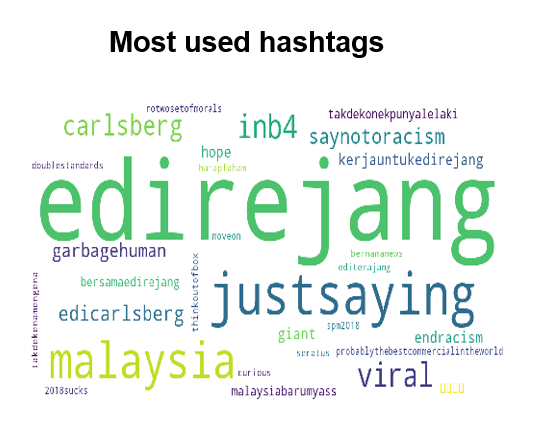 Based on the common words and hashtags used by Twitter users, majority of them are against Edi Rejang. Words such as ‘racist’ and ‘harassed’ were used on him, while for hashtags, there are ‘#saynotoracism’, ‘#garbagehuman’ and ‘#endracism’. Nevertheless, netizens on Twitter opposed Edi’s action in their own ways. First, we have the purple group which is the largest cluster in the network. This group disagreed with Edi’s action but also against the information disclosure of Edi’s daughter. Besides, this group also said that Edi have apologized for his mistake, thus the public shall stop cyber bullying him. The main influencers in this group are @fiqsunny, @Mommymonster6 and @bongkersz. Next, we have the green group which conveyed a similar message with the purple group, opposing the idea of spreading Edi’s daughter information to the public. However, this cluster consist of different influencers, which are @v_vivekkk, @ProphetDora and @TeoNieChing. Then, we have the orange group. This cluster argued that there is nothing wrong in giving out beer sample at the non-halal section of a public supermarket. The users in this group labelled Edi as a racist individual. 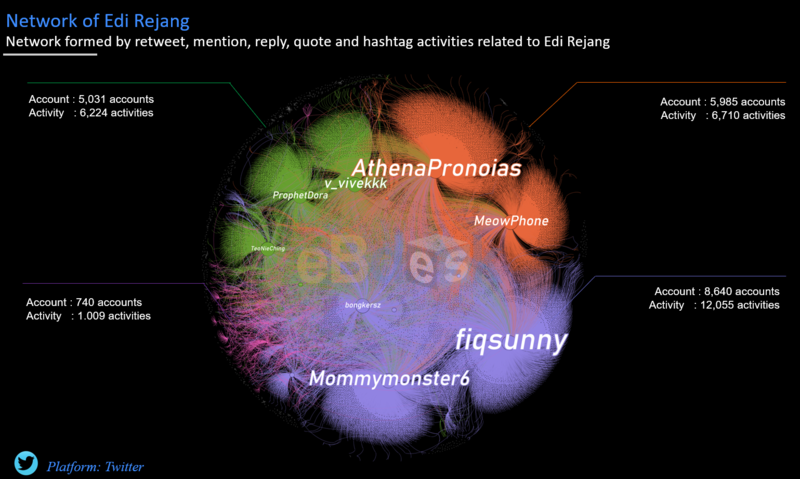 The primary influencers in this cluster are @AthenaPronoias and @MeowPhone. Finally, we have the pink group, which protested not only against Edi but also racism in general. 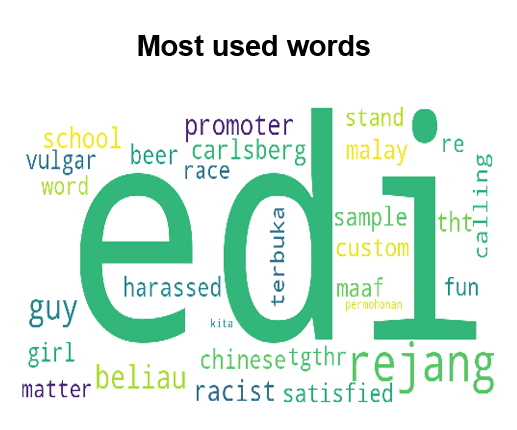 In summary, majority of the people are against Edi Rejang’s misconduct, but not all of them attacked him blindly. Next PTPTN new loan repayment scheme, a rash move?